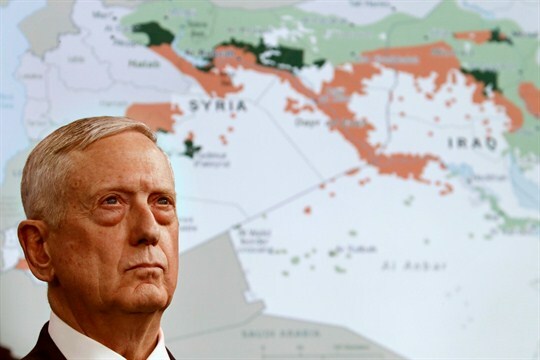 U.S. Defense Secretary Jim Mattis stands in front of a map of Syria and Iraq during a news conference at the Pentagon, May 19, 2017 (AP photo by Jacquelyn Martin). As it approaches parliamentary elections next month, Iraq is not poised for either a major political transformation or massive security improvements. Instead, as a U.S. official who has worked on Iraq for many years has often noted to me, “Iraq is like a cancer patient, but a patient that we have some idea how to treat.” Despite that prognosis, the country should still be at the center of any U.S. regional strategy to stabilize the Arab world. With Iraq emerging from a period of acute crisis after the Islamic State’s territorial advances were reversed, at great cost, the United States has a significant opportunity to assist in ameliorating its chronic ills.